Browse our slowest growing hedging species, these hedging plants are ideal for the smallest decorative hedges and many of them are good Box (Buxus) replacements where Box Blight is a problem. Slow growing hedges make for ease of maintenance, we have lots of species for small hedges and a few that can make taller hedges for privacy - such as the Spotted Laurel and Osmanthus Burkwoodii. Slow Growing Hedges – There are a lot of people that like the idea of a hedge in their garden but do not want the additional work of one that is going to get too high too fast and requires lots of trimming to keep it under control because an unsuitable species of hedge has been chosen. A hedge planted with shrubs having a slow growth rate is the perfect answer, especially if you are creating a garden with areas to give interest, dimension, definition and colour, being easier and less intensive to maintain. 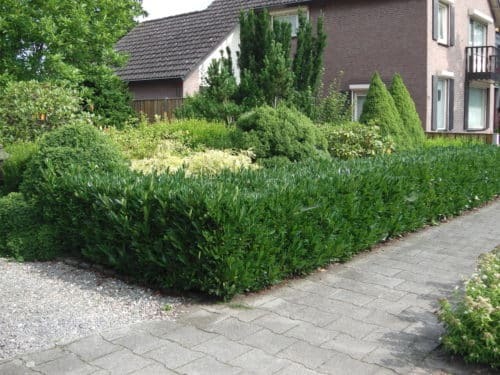 All of our slow growing hedges have a growth rate of 20cm per year or less and so will only require trimming once a year to keep them in order although more frequent trimming will give a particularly sharp and manicured look. All of our Box Hedging varieties are slow growing, in particular the Dwarf Box (Buxus microphylla Rococo), we also stock common Box and Buxus microphylla Faulkner, a lovely hedging variety with fresh bright green leaves. The dwarf Purple Berberis (Berberis thunbergii atropurpurea Nana) is a small hedging gem with rich purple foliage on a plant of tiny proportions, perfect for a colourful low hedge. Several of our Euonymus varieties make first class low maintenance hedges, particularly the Golden, Silver and Green Spire varieties, these plants also offer a choice of colour which can be useful when planning the intricate designs of a knot garden. Japanese Holly Hedging has become much more popular in recent years, many people use it as a substitute for Box because it is not susceptible to blight and it has a similar slow rate of growth. Another under rated hedge species of a similar size is Sweet Box or Sarcococca which will produce very sweetly scented flowers during the Winter months making this a great choice for a small hedge bordering a path or seating area where the perfume will be appreciated. Compact Laurel and Photinia Little Red Robin are much smaller forms of popular hedging plants and as they are both evergreen these species can bring year round interest for small slow growing hedges. With its larger leaves the Spotted Laurel can with patience make a slow growing hedge capable of giving eye level privacy, likewise the fragrant Osmanthus Burkwoodii will make a beautiful screen up to 2 mtres high that is very easy to maintain. 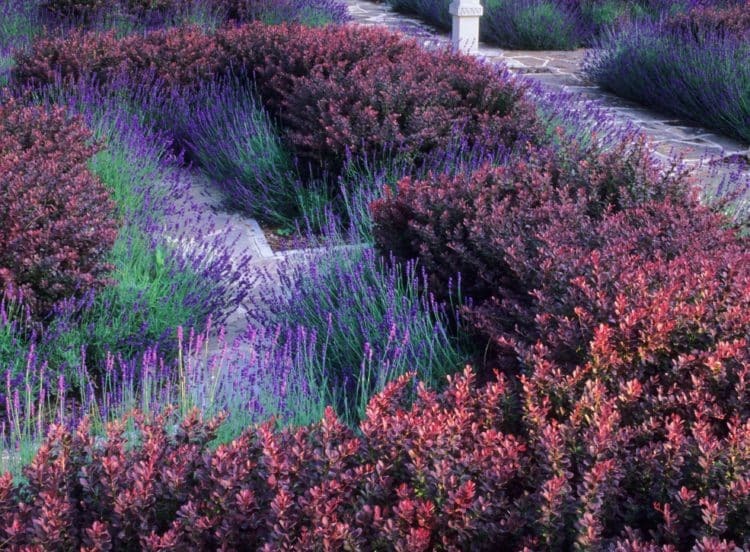 Many small flowering hedges are slow growing too, especially the Lavender hedges, Potentilla, Spiraea and the Dwarf Purple Plum (or Red Leaf Sand Cherry) which also has colourful foliage.